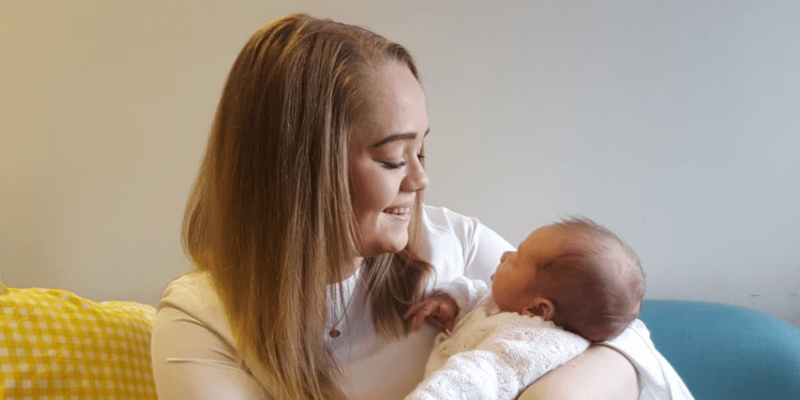 My name’s Hollie, I’m 20-years-old and on the 31st August 2018 I gave birth to my beautiful little girl, Beau. I wasn’t with my boyfriend long before I fell pregnant, and when I told him his reaction was horrible, the first words out of his mouth was ‘well you’re getting rid of it ’ and that’s when the reality of being pregnant really kicked in for me. I hid my pregnancy for a while, I didn’t talk to anyone and I got myself really depressed. My boyfriend told all of his family and they weren’t too bothered, but they didn’t talk about it which made things very difficult. It was weeks before I told anyone I was pregnant but it was hard as I got really bad morning sickness and it was difficult to keep making excuses for it. My friends noticed my mood change and they noticed that my relationship was becoming worse, as my boyfriend began to hate the decision of me keeping the baby he got very verbally abusive and everyone could see it but me. I think I was blind to how bad I let my relationship get with the idea of keeping my family together. I was just over a month pregnant when I was sitting at my sister’s house and she asked me what the latest gossip was from me, and that’s when I broke down and told her what was going on. She was shocked to say the least but she was supportive of what I decided to do. I never got to sit down and tell my mum what was going on, she went through my handbag and found the test and confronted me herself. She was so disappointed which was so horrible to see, and when she sat me down with my dad to talk about it all she done was cry and shout. My mum and dad were so prepared for me to have an abortion but I had already made my mind up that I wanted to keep the baby even if I was to do it alone. 3 months pregnant and my relationship completely collapsed, the person I saw myself starting a family with was now a monster who I completely hated, he become very nasty and abusive and I could finally see who he truly was, he then decided he wanted nothing to do with me or our baby girl when she was born. Two months after we broke up I didn’t hear from him at all. I stayed in touch with his family, so they was able to be in his life even if he didn’t want to and they were really happy I did so. When I was 5 months pregnant he decided that he wanted to be a part of her life when she was born but he was now into going raves and doing drugs regularly, so I told him he was to clean himself up before he was to be a part of her life but that really didn’t go down well and the verbally abusive person he once was, was slowly coming back. I then found out when we was together he was cheating on me with my best friend, and now was in a relationship with her, so I felt like I’d lost my family, my boyfriend and now my best friend. When I was 6 months pregnant I’d finally started getting a good relationship with my family again. They were now very supportive of my decision to keep her, and they had a lot of respect of the idea I had decided to be a single parent. I didn’t hear much from my baby’s father after that probably around once or twice a month. He would contact me to ask to see her when she was born but after everything that had happened I was just ignoring the texts and phone calls. When I was 8 months pregnant I was in a head on car crash which meant I was now going into early labour, I had to be induced as both me and my little girl were very distressed, but this was only the start. I was in my induction for a week before my little girl made an appearance and this meant a week of scans and examinations, needles and drips, and being constantly monitored. Because of my age they tried avoiding a C-section but after a week of failed induction it was the only way she was able to be delivered safely. On the 31st August 2018 at 20.56 my little Beau was finally here weighing 7lb 8oz and she was perfect, it has taken me only a few weeks to recover but in this time I also caught an infection from the surgery. So having a new born, in recovery and being a single parent isn’t easy but I wouldn’t change it for the world! I told her father about everything that was happening and whilst I was in the hospital he was texting me more abusive messages but I again ignored them, I only responded letting him know that she was here. He could only bring himself to say ‘thanks’ and when she was 5-days-old he decided that he wanted nothing to do with her and neither did his family. So it’s now just me and her. But I wouldn’t want it any other way and I definitely wouldn’t have wanted to stay in such a toxic relationship. My family are really supportive and help me endlessly with Beau, honestly I now believe there is nothing more important and special than family. Read more from other single parents here. If you need further support and advice, please visit Gingerbread, an amazing charity supporting single families.